That is not a tyre lever. We had now left the relative tranquility of the Mediterranean coast and began heading inland towards the Middle Atlas mountains. To get some distance under our belts we decided to take the main route. We’d only just started thinking that Moroccan driving wasn’t as bad as it used to be, then we arrived in Fez. It all came flooding back. In places like this the highway code might as well be replaced with the Beano. By comparison to say India, it was actually fairly well organised chaos as opposed to total chaos but even so it pays to keep your wits about you. 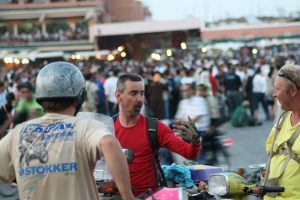 Every set of traffic lights was like the start of a Moto GP race, only with slightly more riders and a lot more donkeys. Local etiquette dictates that the horn must be applied constantly. Only brief silences are permitted when your spare hand is otherwise engaged in lighting your pipe or combing your moustache. There is no such thing as a two or three lane highway. Instead, lanes are determined by the number of vehicles that can physically fit in the space without a pile up. The entertainment value reached its peak when Charlie failed to slow down for a roundabout. This particular roundabout was either five or eight lanes wide depending on whether you count people selling melons as traffic. We looked on in awe as Charlie weaved through the tiniest of gaps. He narrowly missed a bloke walking against the traffic, pushing a wheelbarrow made from a bath tub. 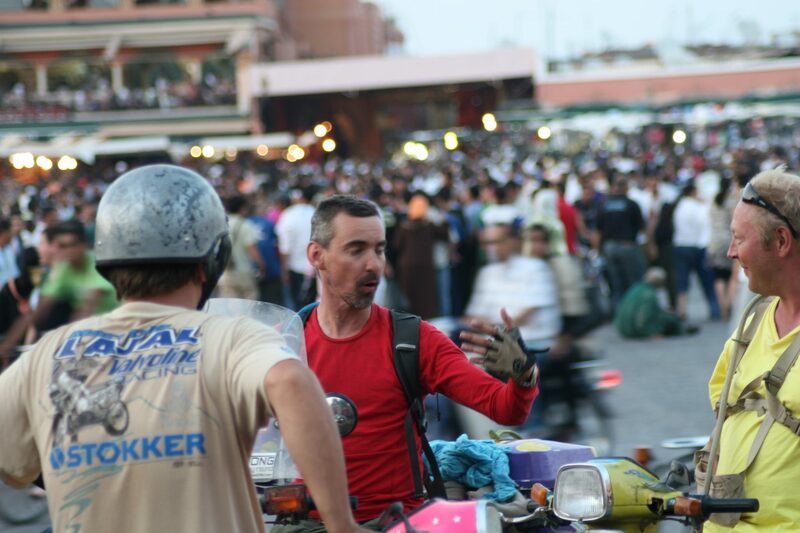 We assumed Charlie had simply earned his Moroccan racing stripes quicker than the rest of us. At least, until we found him on the far side of the roundabout looking for his rear brake pedal. We decided to make a tactical pit stop for fuel and food. After a long lazy lunch of grilled kebabs we decided to get clear out of Fez and head towards the Atlas mountains. Dusk rolled in. It would soon be time to look for a place to camp. More often than not, our overnight stays are decided by necessity rather than choice. Today was no exception. As we started to ascend in to the mountains it became clear Charlie was now having a problem maintaining “speed”. The bike was refusing to rev and started to go so slow that he got overtaken by a crisp packet floating in the breeze. We pulled in to the next town and asked for directions to a campsite. The favoured response from the locals was to point to the top of the hill that overlooked the town. We assumed this meant that there were no campsites, and they were simply directing us on to the next town. But, the top of the hill was indeed a “campsite”. Reason 1) It was dry, dusty and windswept. Not a good combo. We should add, the owner also seemed to have the area’s largest collection of stray animals. They kindly left it until about 3am before they started hollering and fighting. Then, a donkey which sounded like it was either giving birth or dying, joined in the chorus. This was only topped by waking to find that an irrigation pipe was leaking, and rather than irrigating a patch of dying grass, it had in fact irrigated Charles’ tent. 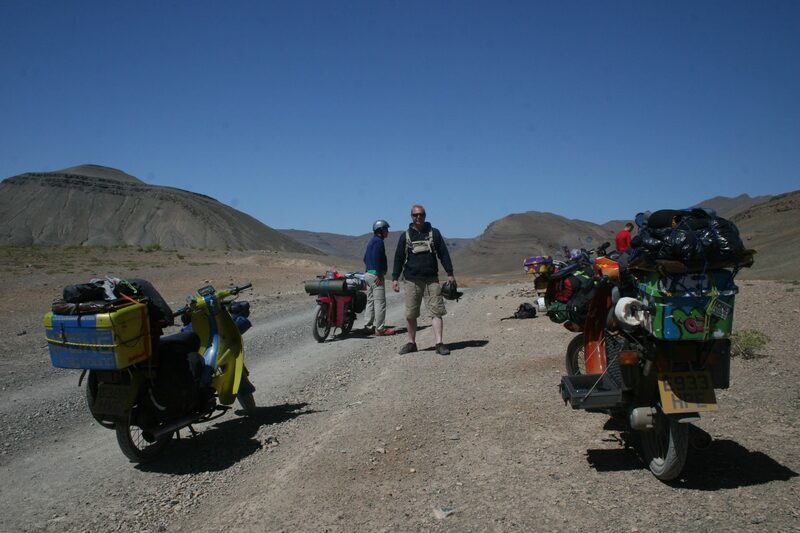 On a positive note, Charles, assuming that he’d pissed himself, got up at sunrise so, by the time the rest of us awoke, he’d already pretty much fixed the problem with his bike (dirt in the carb) and set about knocking up breakfast. 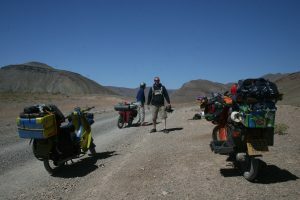 It was a beautiful sunny day and we had an awesome ride ahead, where we would be experiencing the first 3,000 metre peaks. In all the excitement Kaspars was already out of the gate and winding his way up the valley before the rest of us had finished our morning ablutions (one wet wipe under the armpits and one down the pants). On this occasion it was Kaspars who came off worse. A few hundred metres up the valley we started findings bits of his luggage. First a bungee strap, then his jacket, and then his rucksack. A few hundred metres more and we started finding bits of Kaspars’ bike. First his number plate and back light and then his top box. At this point we were expecting to find bits of Kaspars himself. Fortunately he had noticed that his bike had suddenly started handling really well and knew something was quite wrong. The nuts and bolts holding his luggage rack to the back of the bike, had made a bid for freedom. In the process, so had everything on the back of the bike. After spending an hour combing the roadside for the rest of Kaspars’ belongings, we deployed the “banger rally temporary fix procedure”. We promptly set about his bike with gaffer tape and cable ties, so we could limp to the next village for repairs. Some friendly locals who were cannibalising a Peugeot 306, as spare parts for a Mercedes 230E, duly stepped in and found us some replacement nuts and bolts. After a bit of spannering, we were on the way again, albeit an hour or two behind schedule. Not normally a problem this, in fact to be expected, except that today we’d set ourselves a massive waypoint of 350km. 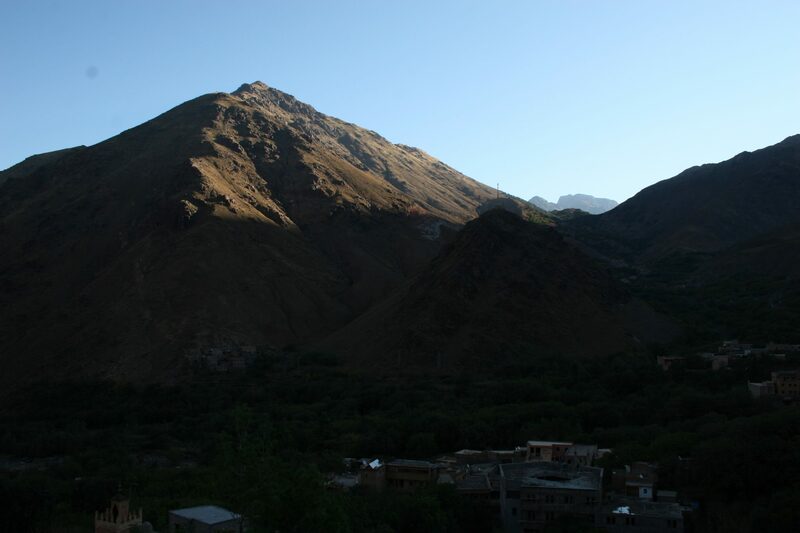 Our target – the village of Imilchil, gateway to the incredible Dades Gorge. Things went well from this point. We had time to enjoy the stunning national parks, despite having been in the saddle for nine hours already. The heat of the day was now being replaced by the chill of dusk. Our thoughts were on finding a hotel in town and downing a well earned hot drink. It’s during those last kilometres of any day’s riding that you are most vulnerable to slipping into autopilot mode. With eyelids drooping and the dull aches of a long day setting. Having not seen a soul for hours we rounded a mountain bend and nearly went head first into a group of villagers coming back from market. The donkeys got spooked by our bikes and some minor carnage ensued as people got catapulted out of saddles while tomatoes and oranges started rolling down the hill. It looked like someone had emptied the kiddies ball pit in McDonalds. After some apologies and general rebuilding of cultural ties, we got a few kilometres further on when karma struck. Kaspars’ back tyre was as flat as a pancake. Such mishaps are not normally a problem except until now no one had questioned the contents of the toolkit. Or envisaged that we might need waterproofs in Morrocco. As the heavens opened, we hurriedly fashioned some waterproof jackets, whilst Oz strode over holding the toolkit with a sense of purpose. A sense that was short lived, when, it became apparent that he’d packed 5 spanners all of the same (but wrong) size> And no tyre levers. So in summary, we were stood half way up a mountain wearing bin liners, with no way to remove the back wheel or get the tyre off. The sun had now dipped behind the mountains and the temperature was dropping further. At this point we had to deploy the “banger rally dig-yourself-out-of-a-hole procedure”. This basically means using items for a task that is not in kepping with their intended purpose. Since Oz (as far as we can work out) has no intended purpose, he was sent to the naughty step. By luck, more than judgement, Oz had at least packed a pair of mole grips and a pair of pliers. These combined with a large rock were used to release the wheel spindle. The tyre was then removed with the combination of a screwdriver, bottle opener and one of the metal struts holding Kaspars’ luggage rack on. Piss wet through, and in near darkness, we still had over 50kms to go to reach Imilchil. On these mountain roads, it meant another 2 hours of riding, but camping on the mountain tracks was an even less appealing option. We finally stumbled in to town, shivering and aching. Like a beacon in the dark we found Chez Bassou, a hotel previously frequented by many explorers. 20 minutes later we were tucking into hot tea and soon after, a sizzling lamb tagine. All hail Morroccan hospitality. It beats a muesli bar from a Travelodge vending machine any day of the week.